Dudley Street has long been Wolverhampton’s main shopping street, possibly because of its close proximity to the old market that was held in High Green, now called Queen Square. 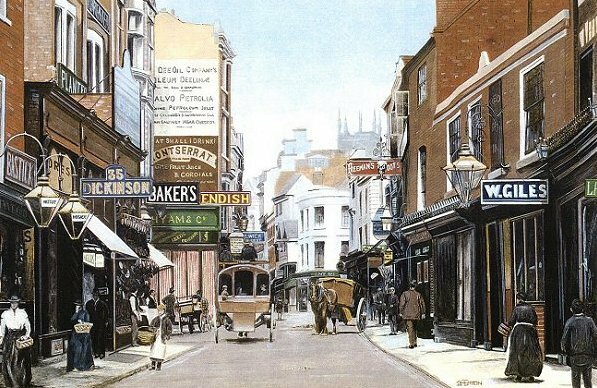 High Green included Lich Gates, and the northern end of Dudley Street, which from its junction with King Street and Woolpack Alley to Queen Square, was known as High Green, and then High Street, until the early twentieth century. Wolverhampton had a market as early as 1179. In 1204 King John took great exception to the existence of the market without a royal charter, and on 4th February, 1258, King Henry III granted a charter for a market and fair, to the Lord of the Manor, Giles de Erdington, Dean of Wolverhampton. There would be a weekly market on Wednesdays, and an eight day annual fair that was held on the vigil of the feast of St. Peter and St. Paul. A market Hall was built on the eastern side of high Green in 1532, on the site of the old medieval market cross. In medieval times the northern part of Dudley Street (previously High Street) was in the manor of the Prebend of Hatherton, and included a horse mill, close to the corner of Woolpack Alley. Much of Wolverhampton was owned by the Leveson family who made a fortune from the wool trade. In 1609, a detailed survey of Sir Walter Leveson’s Wolverhampton estates, provides us with a comprehensive list of his tenants, his property, and his land. At this time the Swan Inn stood on the site of Lloyds Bank, and a little further down near the junction of King Street was a large house, rented by Elizabeth Pershouse, which had a big garden at the back. Nearby were large houses, also with big gardens that were rented by John Wightwick, John Key, and Richard Shenton. 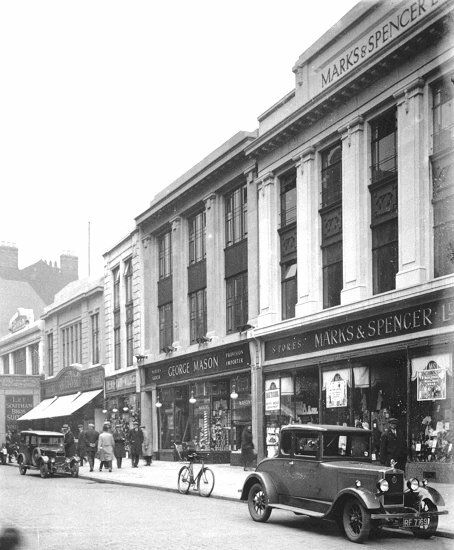 Another large house, which stood roughly where Marks & Spencer's shop is today, belonged to Thomas Molineux. Leveson’s tenants on the western side of the street included Henry Smythe, and also Richard Brett and Hugh Sambrooke, who lived in cottages that were opposite the main entrance to the Old Hall, the Leveson’s home. Part of Isaac Taylor’s map of 1750. Isaac Taylor’s map of 1750, clearly shows the large gardens that were behind some of the grand houses in the street, and also the Charity School that stood at the north western end of the street, along with the old market hall that stood in High Green. The Charity School was built in about 1710 for the education of the town's poor people. In 1716 the school master was paid £26 per year, the school mistress received £12 per year, and the school governess received £7-10s-0d per year. The school and market hall were purchased by the Town Commissioners in 1779 under the provisions of the first Improvement Act of 1777, and soon demolished. The grand houses were eventually replaced by shops and businesses, possibly because of the nearby market, and passing trade. Dudley Street was one of the main routes to the south. In 1770 Pearson & Evans were producing coffee mills in the street, and a few years later Thomas Gibbons and John Marshall opened Wolverhampton's first bank there. Two coaching Inns, the Angel and the Swan stood at the northern end of the street, looking into High Green. The Swan, which stood on the site now occupied by Lloyds Bank, had a large yard at the back where Wolverhampton’s first theatre was built in the 1770s. It was about 80ft. long and 36ft. wide, and could seat around 600 people. A look at Pigot & Company's 1828 Directory of Staffordshire reveals the diversity of businesses in the street at the time. There were four bakers, three boot and shoe makers, three butchers, two cheesemongers, a brazier, a bookseller and stationer, a fishmonger and fruiterer, seven grocers, an ironmonger, a jeweller and silversmith, two drapers, an Irish linen importer, two milliners, a saddler, two straw hat makers, five tailors, two candle makers, six public houses, and a wine and spirit merchant. Coaches ran to many destinations from the coaching inns, including the Swan, the Angel Inn, the Peacock, and the Crown and Cushion. Carriers ran to many local towns from the Pack Horse Inn, the Angel Inn, and the Old King's Head. Dudley Street, as seen from High Green in 1835. From a painting by Robert Noyes. 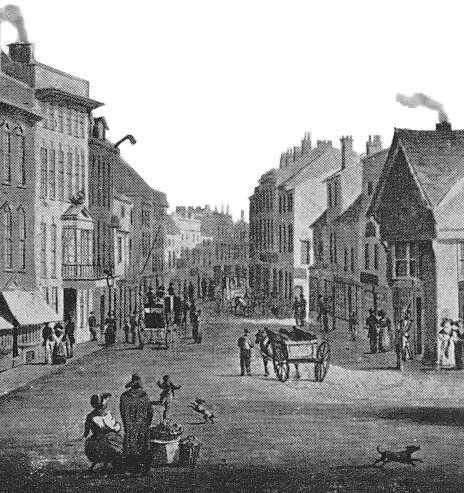 In 1835, an omnibus service began operating from the Fountain Inn in New Street, Birmingham to the Pack Horse Inn in Dudley Street, run by Mr. John Doughty. 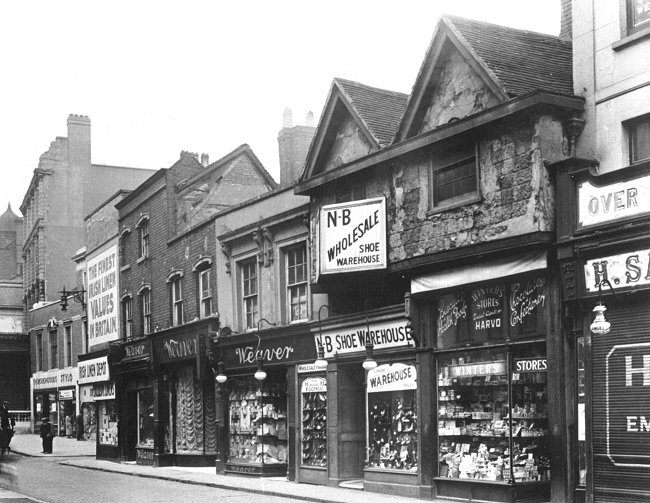 In September of the following year, the Midlands Omnibus Company opened an office in Dudley Street, from where services ran to High Street in Birmingham. By 1838 the company ran four direct journeys daily, and two via Walsall, from the Crown & Cushion, in Dudley Street. By 1847 the number of journeys from the Crown & Cushion to Birmingham had increased to seven daily, the journey taking 95 minutes. The coach went via Bilston, and West Bromwich. Another coach ran twice daily from the pub to Walsall via Willenhall, and yet another coach ran on the same route from the Red Cow, in Dudley Street, three times daily. Another service to Birmingham also started in 1836, run by the Birmingham Omnibus Conveyance Company. 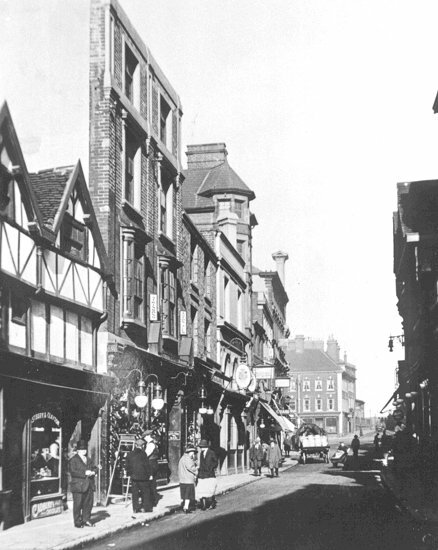 Two journeys were made daily from the Castle Inn in Dudley Street. By 1838 omnibuses were also running to Ironbridge, Shifnal, Wednesbury, and Willenhall. The following is a list of the businesses in Dudley Street and High Street, taken from the 1851 edition of William White’s ‘History, Gazetteer, and Directory of Staffordshire’. Dudley Street featured in the celebrations in 1866 when Queen Victoria unveiled the statue in Queen Square. There were many gas-lit illuminations including an eight feet high star and V.R. 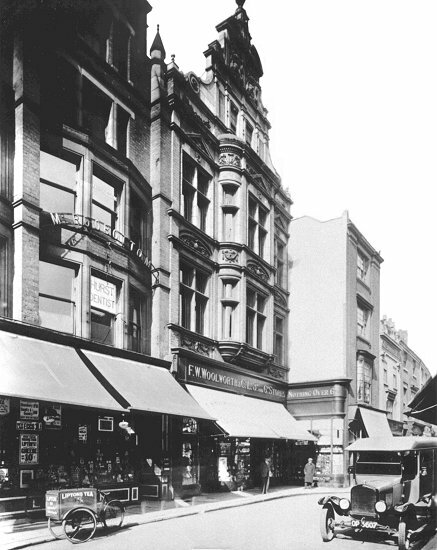 on the front of G. and W. Underhill's ironmongers shop, a large illuminated shield above Masters, wine and spirit merchants shop, a succession of stars above James Tolefree's linen drapers shop, and a large crown across the front of Henry Banks' ironmongers, and Frank Walker's drapers shop, at numbers 10 and 11. Two drawings by J. R. Veal, from his book Old Houses in Wolverhampton and the Neighbourhood, published in 1889. 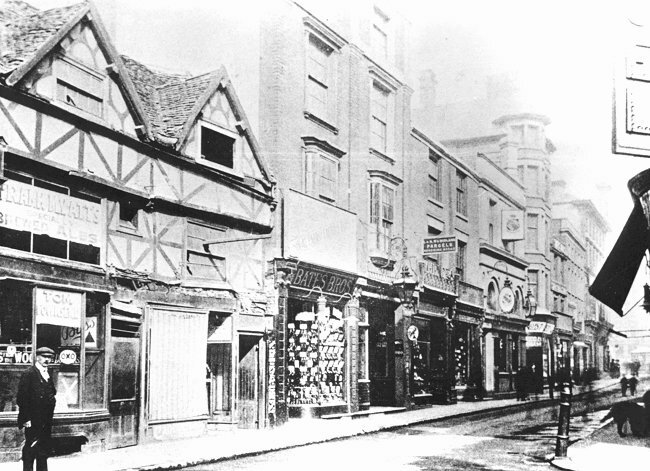 The image on the right shows Alexander Gow's chemist shop at 5 Dudley Street (then High Street), and Phoenix tobacconists next door, with King Street on the right. The shops above, on the left. Courtesy of Eardley Lewis. Also from the Eardley Lewis collection. John Fullwood's version of J. R. Veal's drawing that's above on the right. A photograph of the shops above. Courtesy of Eardley Lewis. 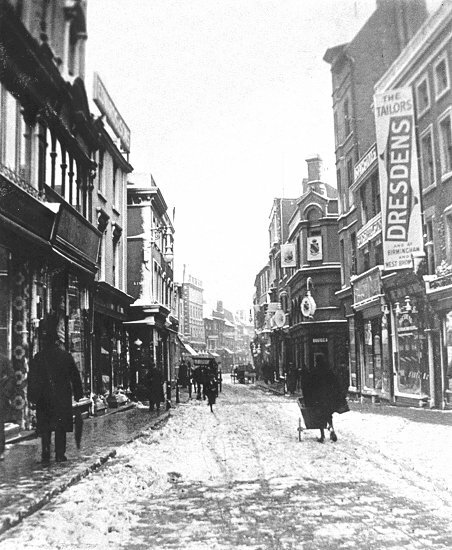 A cold wintry day in the late nineteenth century. From the Eardley Lewis collection. Dudley Street in about 1900. By Alan Eaton. A view from the 1920s. Another view from the 1920s.